Bruce Jackson gets a special mention for his contributions to the live audio industry. In addition to his technical feats with Clair, Lake and Apogee, he also mixed some of the biggest names in music history. The following interview and article (5 pages) explains what is so special about Lake DSP units. Bruce Robert Jackson (3 June 1949 – 29 January 2011) was an Australian audio engineer who co-founded JANDS, an Australian audio, lighting and staging company. He joined American touring audio engineer Roy Clair and mixed concert stage monitors for Elvis Presley in the 1970s. With Clair Brothers, a concert sound company, Jackson designed audio electronics including a custom mixing console. Beginning in 1978, Jackson toured as Bruce Springsteen’s band engineer for a decade, using Clair Brothers sound systems. A business interest in Fairlight CMI in Sydney introduced Jackson to digital audio, and he subsequently founded the digital audio company Apogee Electronics in Santa Monica, California, where he lived at the time. After selling his share of Apogee, Jackson co-founded with Roy and Gene Clair a joint venture which produced the Clair iO, a loudspeaker management system for control of complex concert sound systems. Jackson turned the venture commercial with the help of Dave McGrath’s Lake Technology. Dolby Laboratories bought the technology and formed Dolby Lake with Jackson as vice president, then in 2009 Lab.gruppen acquired the brand. Jackson was honoured with the Parnelli Innovator Award in 2005 for his inventive loudspeaker controller. While still a partner at Apogee, Jackson began touring with Barbra Streisand, mixing concert sound and serving as sound designer from 1993 to 2007. With two other audio engineers he received an Emmy Award for sound design and sound mixing on Streisand’s TV special Barbra: The Concert. Jackson worked on sound design for the 2000 Summer Olympics in Sydney and served as audio director for the opening and closing ceremonies. He performed the same role in Doha, Qatar, at the 2006 Asian Games and in Vancouver, Canada, at the 2010 Winter Olympics. The following quotes from the WIKI site above explain why Bruce was such an important part of the live audio industry. As an independent engineer, Jackson signed a contract to work directly for Bruce Springsteen, on concert tours supported by Clair Brothers. Jackson mixed Springsteen on four major tours from 1978 to 1988, and is credited as engineer on the album Live/1975–85. The tours include Darkness, The River, Born in the U.S.A. and Tunnel of Love Express. Prior to each tour, Springsteen and the E-Street Band practised at Clair Brothers in Lititz to check out new sound system components and lighting effects, and to give crew members a chance to work out the technical details. Jackson mixed the rehearsals and concerts on the folding console he designed for Clair Brothers. Springsteen called him “BJ”. Right away, Jackson noticed that Springsteen was a very particular critic of his own concert sound. At every new venue, Springsteen would take “BJ” around to various seats in the concert venue, sitting in every section, even the last row of seats, and listen to the E-Street Band play. He asked Jackson why the sound was not so good far away as it was up close, and if the audio crew could do anything about it. Jackson said, “we can do a lot about it”, and worked with Clair Brothers to design a ring of delay loudspeakers positioned closer to the farthest seats to augment the high frequencies lost over distance by sound waves travelling through air. This made the hi-hat sound more “crisp and clean”, with higher quality sound in the back row than previously experienced in such large venues. Throughout Jackson’s years with him, Springsteen maintained his interest in delivering high quality sound to every seat, and the solutions grew in size and complexity until by 1984 there were eight rings of delays set up for the largest venues. In 1981 for the River tour, Jackson arrived at a “checkerboard” configuration of loudspeakers which were supplied with nominal left and right stereo signals, the signals connected throughout the sound system in an alternating pattern of vertical lines of eight loudspeakers each, giving the audience a semblance of stereo imaging otherwise impractical on such a large scale. He continued its use on the Born in the U.S.A. tour in 1985. A reporter from Popular Mechanics described the 160 main and 40 auxiliary loudspeakers typically used at a large arena or stadium. Jackson set the main loudspeakers 54 feet (16 m) high on scaffolding, each enclosure holding two 18-inch low-frequency cone drivers, four 10-inch mid-frequency cone drivers, two high-mid compression drivers and two high-frequency compression drivers. The auxiliary zones covered audience areas which wrapped around to the sides of the stage. The 200 loudspeakers were driven by 96 amplifier channels capable of putting out a total of 380,000 watts. The tour was said to have drawn “unusual critical acclaim for crispness and distortion-free performances.” Jackson was nominated for a TEC Award as 1985’s best sound reinforcement engineer but Gene Clair received the honour. Jackson was close to Presley, but the two men were not near in age. Springsteen was closer to Jackson’s age and the two got along as friends, the singer giving a Jeep off-road vehicle as a gift in thanks for his contribution to successful concerts. Jackson said of the Jeep that he sold it after tiring of “bouncing around the place in it.” In 1988, Jackson quit touring at the birth of his son Lindsey. He settled in Santa Monica, California, to concentrate on audio electronics ideas. Streisand employed Jackson’s mixing talents on her 1995 TV special called Barbra: The Concert. Along with Ed Greene and Bob La Masney who worked on post-production mixing, he received an Emmy Award for sound design and the mixing of the live show. Jackson designed the sound for Streisand’s 1999–2000 Timeless: Live in Concert Tour, and he mixed the New Year’s Eve concert 31 December 1999 at the MGM Grand Garden Arena in Paradise, Nevada. He mixed Streisand’s appearances in Sydney and Melbourne in March 2000, connecting the large backing choir’s sound mix by optical fibre from a nearby polo field where the choir was stationed. The fibre connection was Jackson’s real-world test of a similar setup planned to be used for the Summer Olympics six months later. Jackson mixed Streisand’s U.S. and world tours in 2006 and 2007, using a Digidesign Venue digital mixing console at FOH for its smaller footprint (allowing more audience seats) and its plug-in audio effects. As well, the Venue mixing system was chosen for its integration with Pro Tools hardware and software, to make 128-channel hard disk recordings of the concerts directly from the three Digidesign consoles: one to mix strings, one to mix brass, reeds and percussion, and one under Jackson’s control out in the audience, with Streisand’s microphone inputs and stems (submixes of other microphones) from the other consoles. The recordings made in New York City and Washington, D.C. were remixed into the album Live In Concert 2006—Jackson was listed as sound designer. Sharing sound designer and FOH mixing duties with Chris Carlton, Jackson made certain that the custom soft dome monitor wedges were positioned correctly aiming up from under the stage to cover everywhere Streisand might walk. Clair Brothers supplied 18 Dolby Lake Processors for the tour, the majority used by Jackson to tune the main sound system, and the rest for control of monitor wedges used by Streisand and by the supporting artist, Il Divo. For Streisand’s voice, Jackson auditioned several wireless microphones and ended up using a Sennheiser SKM 5200 transmitter equipped with a Neumann KK 105 S supercardioid capsule. He used the vocal microphone to test the sound system from different locations around the arena. When the tour hit the UK and continental Europe, Jackson changed from a Neumann to a Røde Microphones capsule, custom made to his requirements; one that Røde called the “Jackson Special”. Jackson used Millennia microphone preamps for any microphone that was required to be sent to multiple mixing consoles, such as at Madison Square Garden where cable runs to the recording trucks were 800 feet (240 m) long. The use of only one preamp prevents the microphone output from being loaded down by too little resistance which can change its tone quality. None of Jackson’s prospects bought one in the first year. He had better luck with Herbie Hancock, Stevie Wonder, and Geordie Hormel who bought two for $27,500 each. Wonder, who had recently recorded Stevie Wonder’s Journey Through “The Secret Life of Plants” using a Computer Music Melodian sampler, paid for his Fairlight by signing a personal check with his thumbprint. He then convinced Jackson to mix sound for a tour he was undertaking in support of Secret Life of Plants. Jackson’s close association with Fairlight made him intimately aware of the limitations of early digital audio, “weaknesses” such as noise and inharmonic distortion. After finishing Springsteen’s Born in the U.S.A. tour, Jackson expressed his ideas about possible improvements to digital audio in a conversation with Christof Heidelberger, a designer of digital audio electronics, and Betty Bennett, the president of Soundcraft’s U.S. division. Jackson, Bennett and Heidelberger formed Apogee Electronics in December 1985 (announced in the 23 November issue of Billboard) and started investigating 44 kHz digital audio circuits for audible problems. They found that “textbook filters” which were unnecessarily steep were protecting the CD player output from high levels of 20 kHz signals, an exceedingly unlikely occurrence in music. Jackson determined that Apogee could improve the sound of CDs if the low-pass filters used in the recording process were made less steep, for less phase shift throughout the hearing range. The small company produced better anti-aliasing filters for recording equipment. Initially operating out of his garage, Jackson served as the company’s owner and president, and his third wife Bennett headed up sales. They demonstrated their first product at the Audio Engineering Society’s 81st convention held in Los Angeles in November 1986: the 944 Series low-dispersion, linear phase, active low-pass filter, intended to replace existing filters on multi-track digital tape recorders such as the Sony PCM-3324. After a slow start, the firm sold 30,000 of the filters: “a great success.” The 944 earned a TEC Award in 1988, the first of many such awards for Apogee. Apogee’s branding was largely Jackson’s doing. Bennett said in 2005 that the company’s decision to sell purple-coloured products was one of Jackson’s ideas: “He has a good eye for design, and we wanted to distinguish ourselves from the all-black rack gear that everybody had at that point.” Jackson encouraged a lighting designer from Clair Brothers to sketch a company logo on a cocktail napkin over dinner one evening, and that was immediately made the Apogee logo. 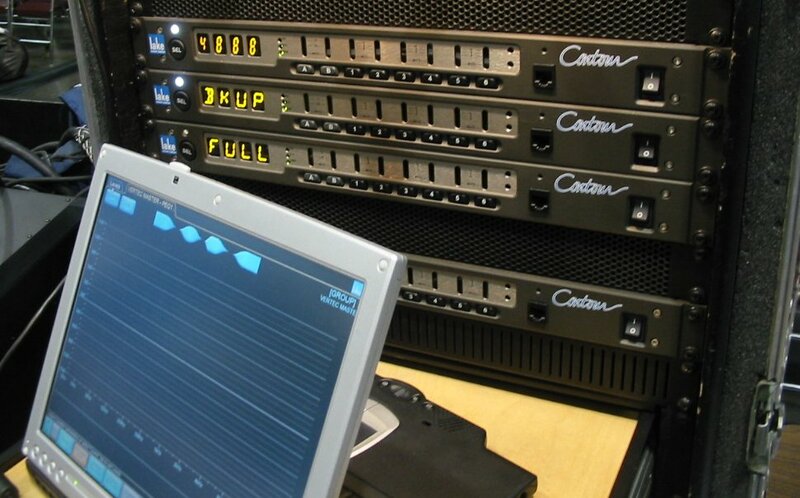 After leaving Apogee, Jackson entered into a joint venture with Clair Brothers to design a digital loudspeaker controller for control of complex concert sound systems. Jackson estimated that the project would cost $800,000 in U.S. dollars, but it ended up costing Clair Brothers more than $2M. From the same garage in which he started Apogee, Jackson developed the proprietary Clair iO: a two-input, six-output digital audio matrix with opto-isolated output circuits. 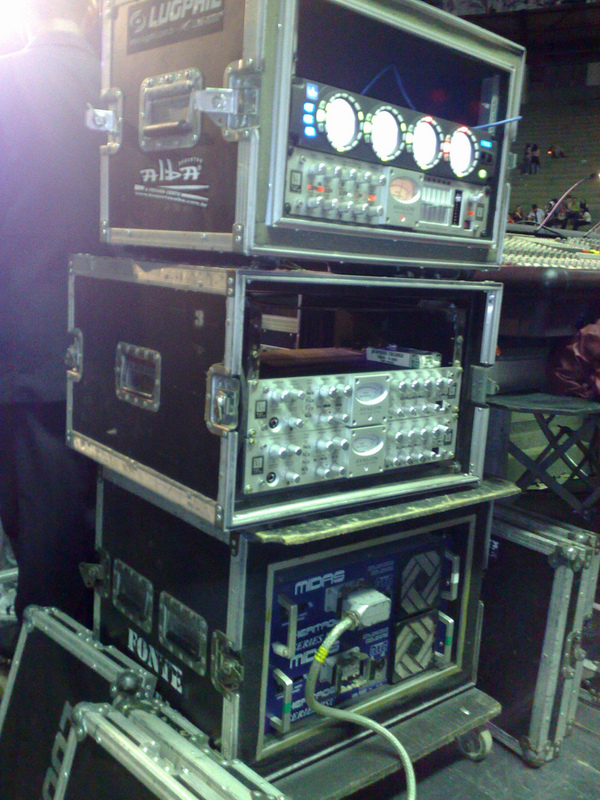 An essential element of the system was its ability to be controlled by wireless tablet computer by an audio engineer walking around to various seating sections in a concert venue, to tailor the system’s response more precisely.